Otis’ sparkling narrative, alive with the dialogue of struggle, is an indictment of the protected white enclaves that still exist in our nation’s diverse cities and an affirmation of those determined enough to transform them. In light of the recent racial troubles sparked by public servants in Ferguson and Staten Island, this powerful and insightful book couldn’t be timelier. This book is far more absorbing than any fiction and if you are not a New Yorker, dive in you will qualify to be native of this city by just reading Firefight. With top notch reporting, vivid writing, and an unquenchable thirst for truth Otis at long last makes order out of the chaos of this important New York story. Ginger Adams Otis unfolds her story with telling details, searing anecdotes, and a vivid touch, bringing alive the personages on both sides of the issue, as well as the city politicians ducking for cover over the decades. 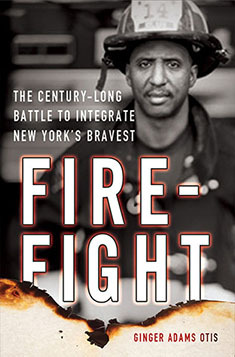 This is a riveting account of the hundred-year battle on New York City streets, in its courtrooms and inside its firehouses to racially integrate the nation’s largest fire department. Ginger Adams Otis has written a spellbinding history of the long and relentless struggle to tear down the Fire Department of New York’s unwritten color bar. Ginger Adams Otis’ amazing book is must reading for anyone interested in how cities work.